Just a few disconnected thoughts on a Friday morning. I thought “Disconnected from each other, Connected to the farm” was too long of a title and may be more useful in discussing family relationships. Yesterday Julie was away at a class learning about AromaTouch, a massage technique involving the oils she sells. Apparently it is quite relaxing. Julie fell asleep when they demonstrated it on her. While she was out I had a long list of farm chores to do. Along the way I discovered one milker inflation has a tear in it. The inflations are made to be used for one lactation only but we have used ours longer. We rotate which three teats we milk on the cows so we will simply stop using that inflation for the remainder of our milking season (10 more days). The tear does not impact the function of the milker as it is held closed when the milker is in place but I am concerned about what could live in that seam. Better just to skip it. Our first frost was two days ago (two weeks late). The air temp didn’t get below 38 but there was ice on the windshield. Those are the mornings I need to be out walking the farm. I found this in a well known frost pocket. The clover won’t last much longer. Sigh. It is important to know where frost pockets are as they impact where you would plant certain things and where you will graze your cattle. 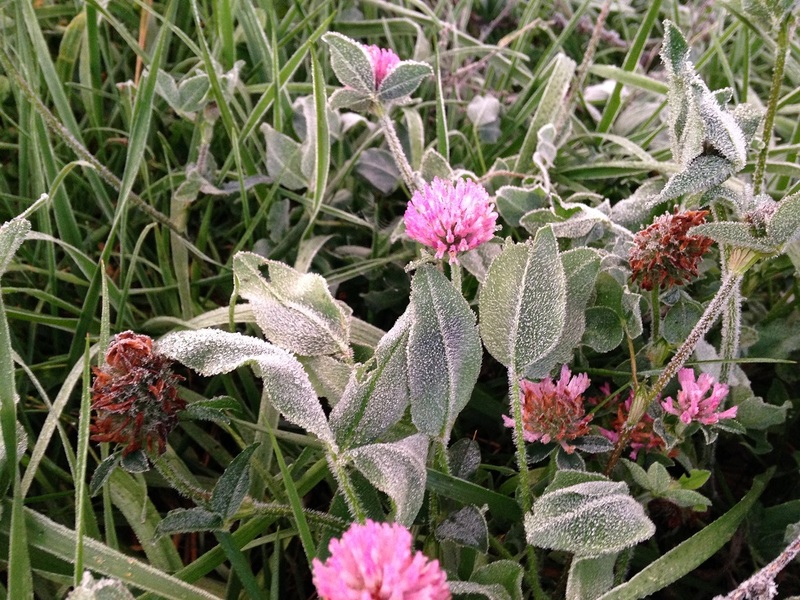 There are a few plants (like clover) that are best left ungrazed when frosted. My day yesterday was primarily spent rediscovering why you should never, never, NEVER use powdered laundry detergent in a HE washing machine. I was up to my elbows in our sewer line, complete with a big hole in our yard. Dad found a livestock drinker on CL yesterday for $150 just like our other hog waterer. The lady had been using it to keep her dogs watered. It’s not new but it is in good shape. The float is out of place and it is missing a stopper. No big whoop. We picked that up and got home in time for dinner. While dad and I were out we stopped to look at tractors. Boy, a cab tractor with a loader would be a wonderful thing for cleaning up manure, hauling away scrap iron and digging holes for fence posts. I could own one in a mere 84 months of payments too. That’s the same as renting a Bobcat for a weekend every month for the next 7 years except I would get to pay the repair bills on the tractor. Well, and a Bobcat is really no help in baling hay. I am really wrestling with this. I see the value in owning a tractor with a loader but I also like not going into a debt agreement for 84 FREAKIN’ MONTHS! What’s the big deal? It’s only 40 calves worth of tractor. Well, it is a big deal. Instead of driving to rent a loader every month and only having access to it for a weekend, I could have one here I can use any time at all for the same money. Ugh. How does one illustrate frustration in text? Picture, in your mind, me pulling my hair out while making gurgling noises, sighs and the occational scream. Ugh. Weather ’tis nobler in the mind to suffer the slings and arrows of 7 years of indentured servitude or to take rentals against a sea of cow manure, and by opposing, gain fertility and clean the barn all at once? And let’s talk about the cattle barn briefly. What a dump. Should I repair it? Seems like tin comes loose every month. The north wall is leaning out at about a 30 degree angle because cattle have pushed on it for decades. There is metal siding over old wood siding and it’s only partially on, partially laying in the pasture waiting for me to clean it up. It needs a loft put back in it. Should I do that first or should I fix the white barn first? Don’t get me started on the white barn. What do I need a loft in the cattle barn for? I’m reading The Farming Ladder again. Henderson says he gives each of his five fresh milk cows two hundredweight of straw each day. EACH DAY! I’m not British. I don’t speak in terms of “stone” and “hundredweight”. Am I right in understanding that to be the rough equivalent of 4-5 square bales of straw? Each day? I can’t imagine it. Can’t. Imagine. It. I mean, I can but…no way. Let’s try it with a pig. A bale of straw costs $2. I suspect you could put down a bale of straw each day for a pig and keep the pig clean while capturing the liquids in suspension. After 120 days the pig leaves the farm and you have 120 bales worth of straw holding manure for you. Per pig. $240 worth of bedding. Per pig. Can’t imagine. There are certainly cheaper sources of carbon but Henderson is pointing out that I’m not doing enough. That I’m not making fertility a high enough priority. He transported 600 loads of manure to his fields each year. Can’t. Imagine. But maybe that’s why I need a loader tractor. Back to that again. I have a mountain of unpublished blog posts I need to get out. I’m just having a hard time finding the time to get it all done. Similarly I’m behind on work and I can’t seem to find time to read either. I’m not sure what is happening. Am I being affected by the short days? Dunno. Anyway, Diary. Thanks for listening. This entry was posted in Family Life, Seasonality. Bookmark the permalink. Your internal struggle with the tractor loader exactly parallels my struggle over buying a pick up truck. I’m a little lower down on the ladder than you 🙂 but I can definitely relate. I can relate on the barn repair too. We discussed getting quotes to get the barn repaired – roof on both sections, reframing the rotted door frames, replacing siding on the weather side, replacing any supports on the inside that have succumbed to the damp from all the leaks. It’s going to cost a lot . A Lot. Do I even need the barn? Well, I need some kind of barn, but this one, having been built by one farmer and adapted by another for dairy, has a lot of inconveniences for the sorts of things I want the barn to be. So I don’t know. Frost is coming soon here too, I can feel it. It was cold last night moving the chickens into the hen house. Finger nipping cold. Better start draining hoses. You know my thoughts on this and I can see your points. I thought the same thing too when I was 36ish, now at 57ish I have lost the ability to clean out deep bedding from 20 head by hand and get tired of battling the weekend warriors at the rental place. Many times that rental bobcat just isn’t there, Whoops, there went the vacation time hubby took off to clean barn the barn and spread the compost pile. Oh well, we’re not really farming, its a hobby, we can’t justify the tractor. But we did, and it’s right up there with things I can’t live without, like my 4 x 4 pickup. As for barn repairs, that is something we can do at our advanced farming age, nailing boards, roofing, pouring concrete, all doable, Picking up and moving heavy stuff, not doable or worth the body wear and tear. WWHD? WDHD? Henderson had a loader tractor. He kept the bucket on the front and a box on the back. The tractor was loaded going to and from the field. He also had a specific place to park the tractor and specified maintenance routines. I suspect the tractor was used at least 2,000 hours per year too. I don’t measure up. He would. Actually, if I remember the book aright, his brother had the specified maintenance routines.